No more messing up with pen and paper to manage your diabetic record, organize your blood glucose levels with utmost ease through Diabetes Tracker App, which not only help you stay organized but also will keep a strict eye on health and glucose levels so that you can your life to the fullest without having to worry about your glucose levels. Diabetes Tracker app works great for those who are too busy to keep a log of their blood glucose levels in their hectic schedule or those who are struggling to keep a record of their diabetes level efficiently. Hop on a smarter way to manage and control your diabetes record using your smartphone, simply check your glucose levels and record then in this amazing app so as to maintain your blood glucose levels for regular monitoring and analysis of your monthly, weekly health records, save yourself from the hassle of remembering the sugar levels or noting them everywhere. Say goodbye to the days when you had to think about your diabetes before having your favorite delicacies, plan your sweet intake effortlessly on the basis of the all the data of your sweet intake in our diabetes tracker app. So next time don't think too much before eating or drinking too, simply open the app to check whether you shall have your treat or not. 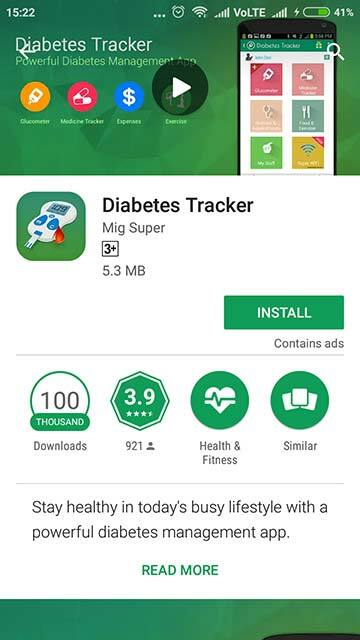 Diabetes tracker app is loaded with too many amazing and helpful functions to look out for as your all-rounder health coach and fitness pal since you not only get rid of your pen paper solution to your blood glucose levels tracking but also from blood pressure levels. Most of the people are suffering from hypertension these days because of increased stress and unbalance office-life pressure, so to help you combat with your blood pressure levels when you miss out on time to have a look on your health record, open diabetes tracker. 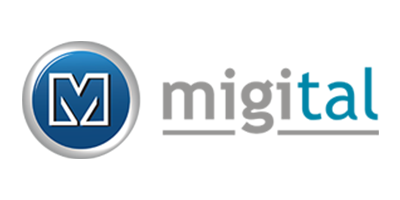 We have got it all covered for you by making a personal health log for you which you can even back up so that you don't lose out on your health records or without any worry to pile up your records or files of your health reports, simply keep them safe in your phone with a data backup. Very few people are well informed about type-1 and type-2 diabetes or gestational diabetes, which needs different attention and care than normal diabetes which is a major increasing concern, but along with diabetes tracker app you get an array of information, helpful tips and lots more to understand the problem if diabetes better and ways to prevent and control it with the help of special fitness and exercise routine, diabetic friendly recipes and lots more to watch out for. How amazing it can get if you can get a solution to all your health problems at once place instead of running out of several places for the right guidance to major health problems. Still wondering, what's more, well we have so many helpful features loaded in our app to help you give the attention your body and health demands from you. As the name suggests Diabetes tracker is a complete solution to monitor your blood glucose levels and various other health problems, so have a look at all the features of diabetes tracker app. When you start using the app, a complete health chart is prepared for you. You get a customized health record exclusively for you to have a depth insight and regular check on your overall diabetic and blood pressure levels over time and other health-related problems. It is easier to attain holistic health if you have a full record of your health over a period of time and to prevent any further ailment. You can track your reports, tests results, exercise routine, expenses, give a voice command and so much more in one place. You get the chart of your health in graphical representation for better analysis. 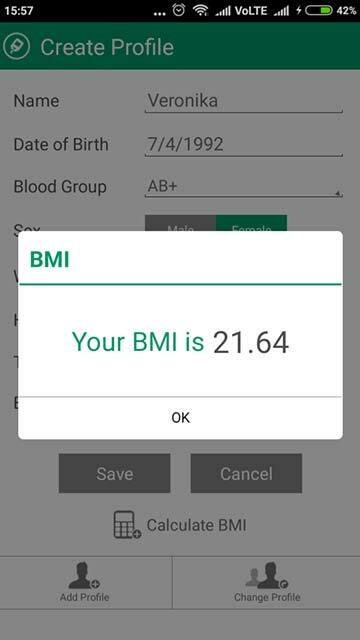 BMI(body mass index) indicates whether you are underweight or overweight and your BMI for a healthy life free from obesity-related problems, all that you have to do is enter your weight and height to get your BMI in one click. 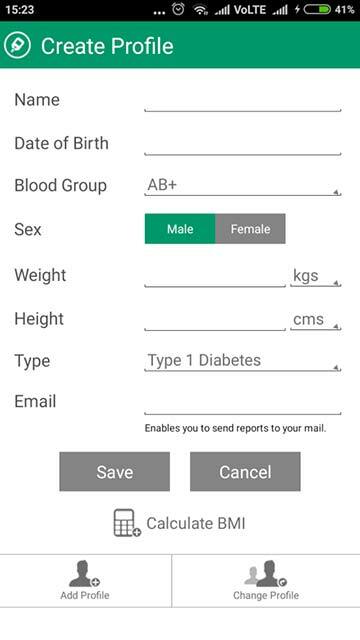 Do you often forget to check your health charts or simply don't get the time to open up the app to have a look on your current diabetes health report, well now you can your weekly/monthly report in your mailbox or Gmail inbox delivered to you, so that you don't miss out on your wellness. 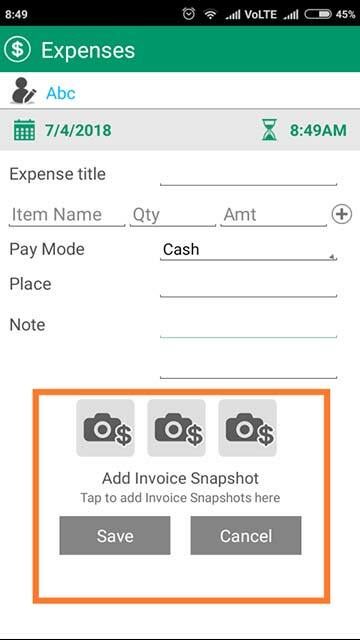 Diabetic medicines, diet, and supplements often burn a hole pocket, so with expense manager you can keep a track where your money is going and a log of your medicine rates and the amount spent on diabetic -specific food and supplement so that you can spend wisely next time. Type-1, Type-2, gestational diabetes might sound like new words to you because most of the people do not have enough awareness what causes diabetes, types of diabetes. It is important to understand what type of diabetes you have and thus take precautions accordingly. 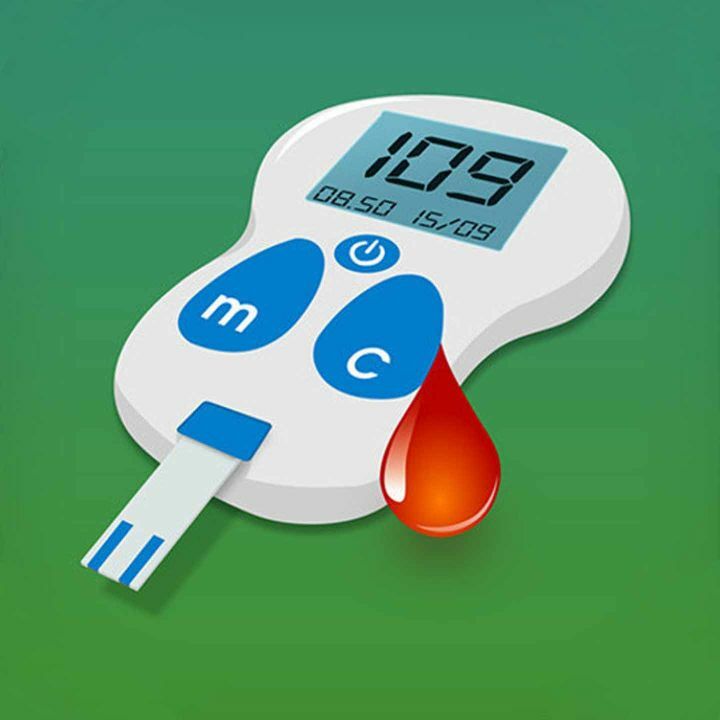 Diabetes tracker app is loaded with such plenty information about every type of diabetes. Diabetes tracker is first of a kind of glucometer which stores all your blood glucose level record to help you stay away from diabetic complication and along with diabetic records, it also monitors your blood pressure levels to lower your hypertension levels and help you enjoy a balanced lifestyle. How many of us remember to take our medicines on time in our daily hectic schedules and then we skip on our medicines, well not anymore because diabetes tracker is your personal virtual assistant which will never let you forget to take your medicines on time and give the who info on your medicines records which you can directly share with your doctor without maintaining a bunch of files in your home. A regular check-up is just as important for keeping health as taking medicine especially for a diabetic person who needs constant consulting from the doctor, through diabetes tracker now can add your doctors, schedule appointments to make sure that you never forget appointments. 80% of the blood glucose misbalances because of lack of proper exercise and diabetic friendly food, both of these decisions the level of your blood glucose, to make them under control. 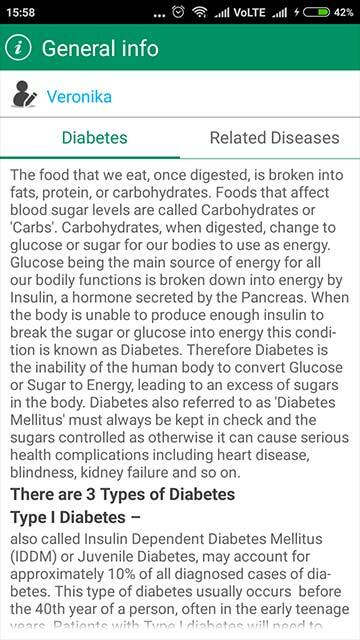 So in diabetes tracker, you can find exercise especially to control diabetes and recipes to control blood glucose levels which are powered by fitness coach and leader, MevoFit. The biggest drawback of managing pen paper based is it's management and keeping it safe from getting lost, but this is not the case with diabetes tracker since you can take backup of your blood glucose levels, blood pressure levels, reports, test result, appointments, doctors and medical reports etc. Diabetes tracker is too simple to use, perfect for any age and person, it's ease of use makes it ideal to make it your daily partner in keeping a health record in one place. 1. How can diabetes tracker be useful for diabetic persons? Through diabetes tracker app, you can record your blood glucose levels in your smartphone instead of pen paper which is not only more convenient but also more efficient to track your blood glucose levels and monitor your health. 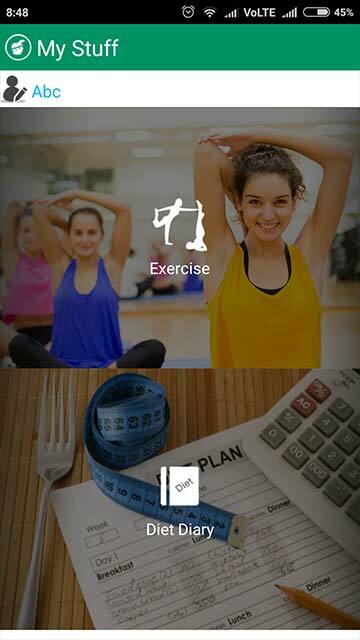 You can save the reports, view your exercise progress and much more in this app. 2. How to use diabetes tracker to analyze my health condition and blood glucose levels? Through your diabetes record, you can check the status of your blood glucose levels over a period of time which helps you in deciding how precautious you ought to be or the amount of attention that your health needs. 3. How to schedule doctor appointments using diabetes tracker? Open doctors and appointments section in the app, add the list and profile of doctors that you are currently visiting or look forward to visiting. After adding the doctors you can schedule the appointments for that doctor for any particular time or date so that you never forget to attend your doctor, Not only this you can also share your appointments and doctor's information with anyone suffering from diabetes. 4. How will diabetes tracker help me understand more about type-1 and type-2 diabetes? As the ignorance of types of diabetes is increasing among people, we have assembled the best articles containing loads of information about the types of diabetes, how to identify them and how to prevent it and ways to control diabetes. 5. How can I manage blood pressure levels with diabetes tracker? You can easily create a log of your blood pressure levels by keeping a report of your systolic, diastolic, pulse, BP index every time to maintain your BP and set a reminder to help you remind to check your blood pressure levels from time to time. 6. How does diabetes tracker help me in finding the right exercises, tips and diabetic friendly meal plan to maintain blood glucose levels? Along with loads of information on diabetes, diabetes tracker also provides you the best exercises and recipes for a diabetic person to keep the blood glucose levels in control and to make the tasteless life of a diabetic person more delicious. 7. 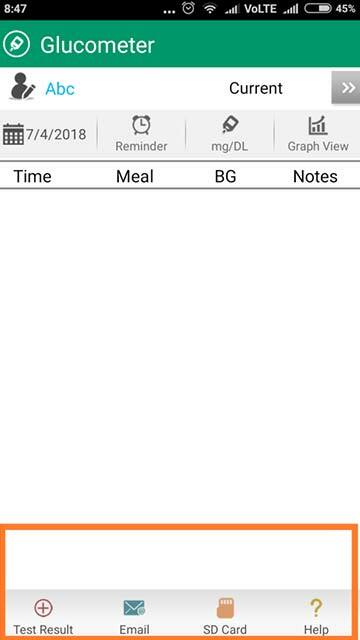 How can I set a reminder for my medicines in diabetes tracker app? 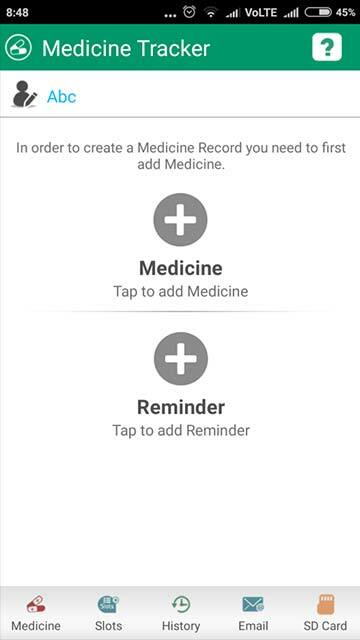 You don't have to install an entirely new app just to remind you to take your medicines, all you have to do is go to medicine reminder section, set the reminder with the name of medicine you wish to take for, and you will never miss out on medicines ever again. You can add slots, view previous medical history, email your medicine course with your doctor or with anyone. 8. How to take backup of my reports and download them? 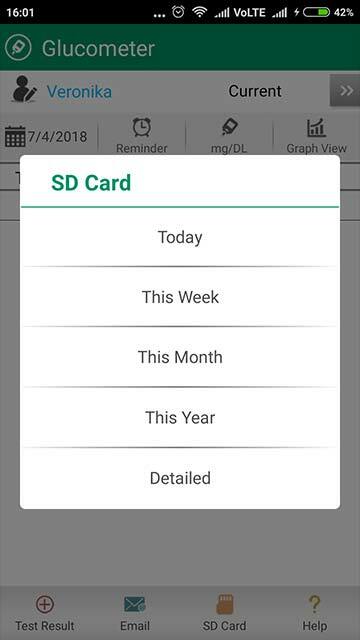 All we can say is effortless, you can take backup of your health reports in your SD card without any hassle, just tap the SD card option in the reports section and there, your reports will never get and be always safe with you. 9. How to email health reports to my email address? Soon after you log your blood glucose result in the menu at the bottom you can find the option to email your health chart and add blood tests report. 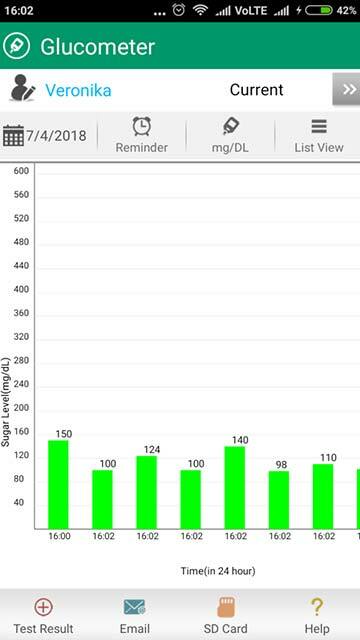 You can view your blood glucose levels in chart form also to run a quick analysis of your diabetic data. 10. 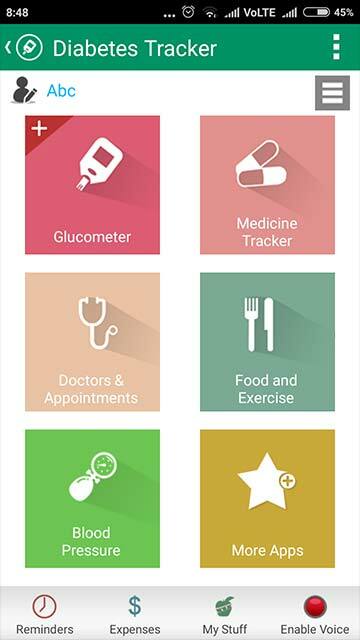 How to find more free and useful apps like diabetes tracker? 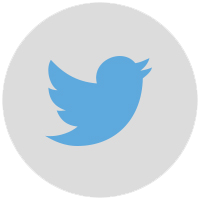 We have so many more different both Android and iOS apps for you that you will love to use. All you have to do is go to more apps section in the menu and you are great to go to use loads of many entertainments, gaming, lifestyle, Information, fitness etc apps on your phone. - Amazing offers to look out for! - Use earned coins to unlock Premium features! 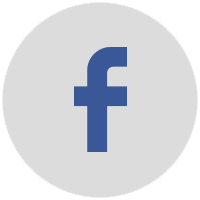 - Track the status of your Credits! Note: Please consult your Doctor before you start any suggested exercise regime or consume any food. For any kind of help or confusion, simply write to us, and we would happily resolve your problems in a quick friendly manner. Diabetes Tracker App is a complete solution to monitor your blood glucose levels and various other health problems with regular hassle-free monitoring. Log your daily blood glucose and blood pressure levels to keep diabetes and blood pressure in control, get the latest information on types of diabetes and how to control it. Get medicine tracker with reminders, doctors appointment scheduler, backup of diabetes record and much in this Diabetes Tracker App. Want some more useful Health & Fitness Apps? Try Fitbites App for your Android phone now.